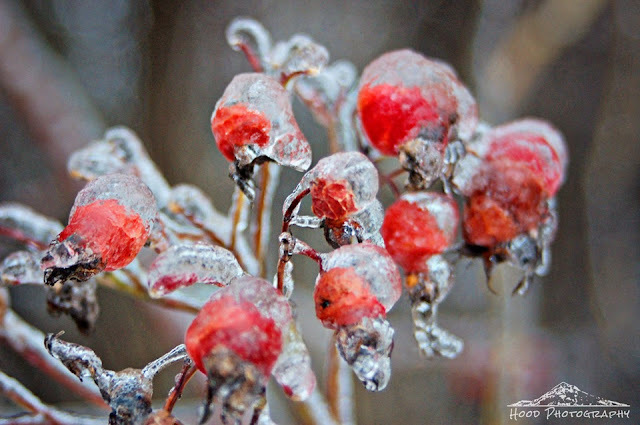 I have another ice storm photo to share today. As I mentioned yesterday, we had a few inches of freezing rain fall overnight on Sunday, and I went out with my camera to capture some of the beauty. I loved the color pop that these old rose hips provided in the otherwise mainly white surroundings. That's how I like an ice-storm. Seeing a good photo after the storm! Pretty! Yes, with all the white snow and ice, it's hard to find some color. They're gorgeous covered in ice. I'm so tired of everything being wet and grey. It does offer up some great photo opportunities. This one's lovely. You capture frozen items very well. I am enjoying them.